Putting the finishing touches on the powder room, folks, and I AM SO EXCITED to show the whole glorious thing to you!! 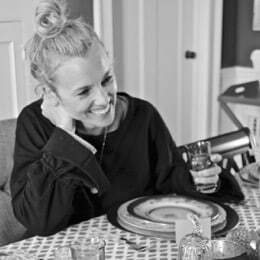 I’ve given some of my blogging besties a sneak peak, but I’m trying to save the fancy shots for a big bad reveal in the next week or so! Today I AM going to give you the deets on the rest of the vanity makeover. 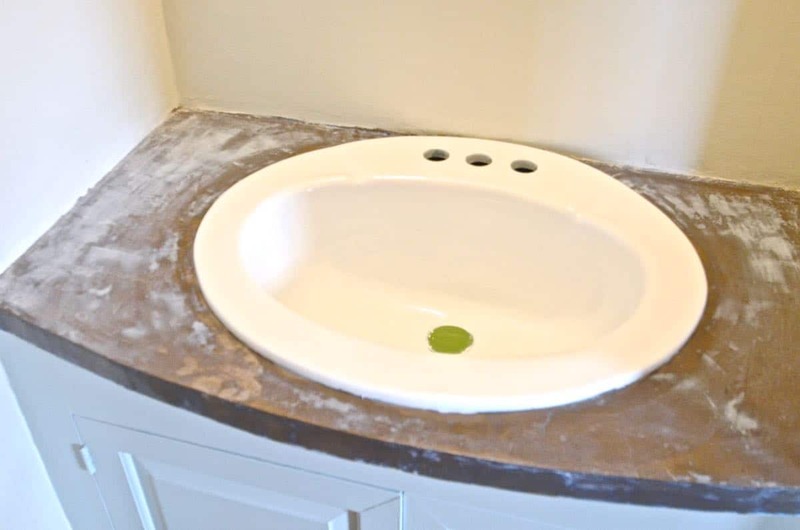 On Tuesday I showed you how to breath new life into a dated sink with a coat of epoxy paint. 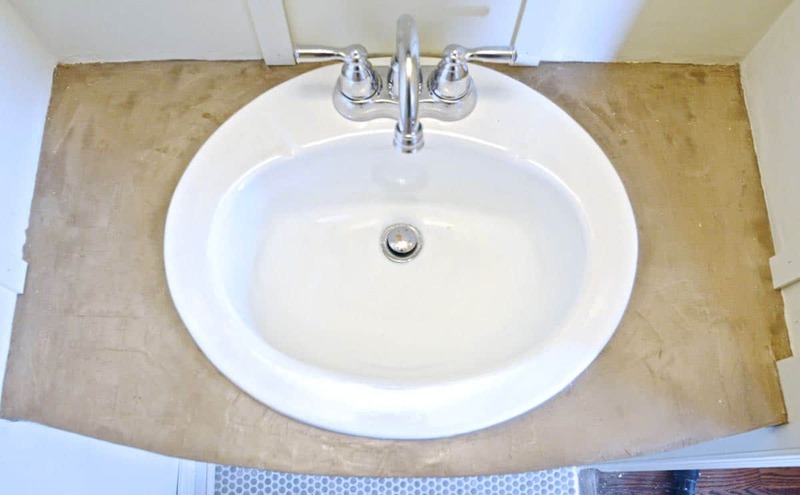 Good as new with no plumbing involved (unless you want to swap the faucet while you’re at it…). 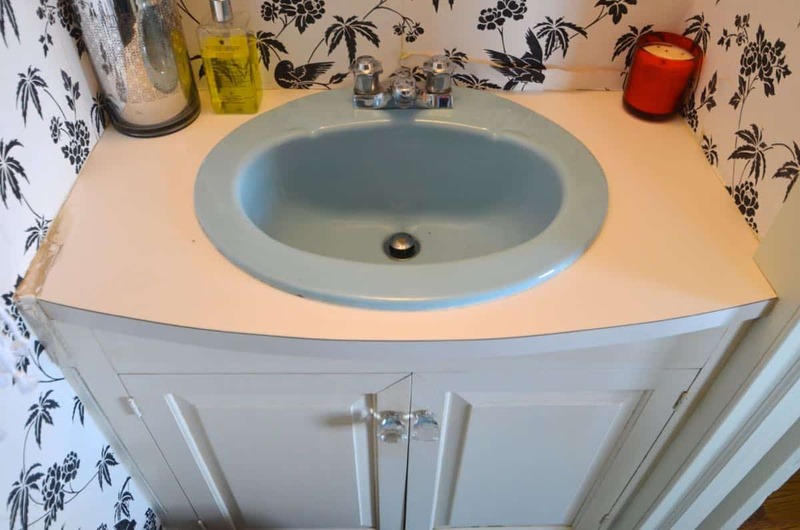 The turquoise sink was bad, but the vanity itself was no great shakes. It was worn down and tired looking. But… it had a great shape and was custom build to fit the ridiculously small space so it actually had a few things going for it. The vanity itself was DIY 101… just a fresh coat of paint. 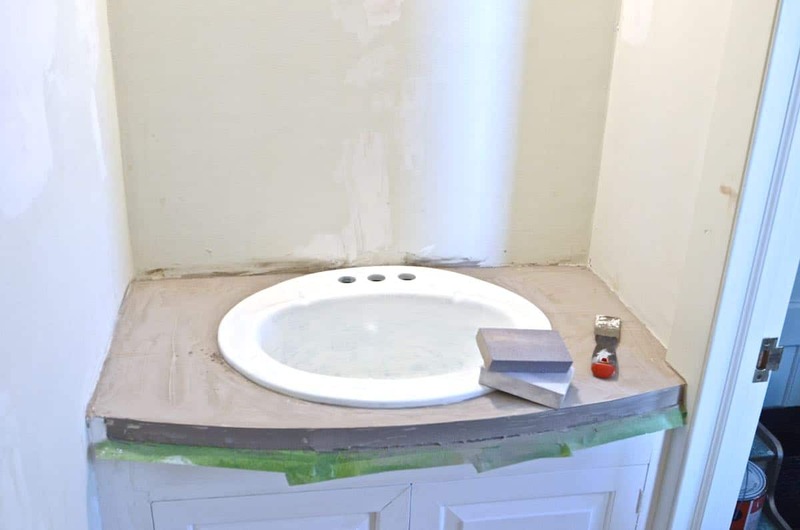 But the countertop, well… THAT was a fun improvement. 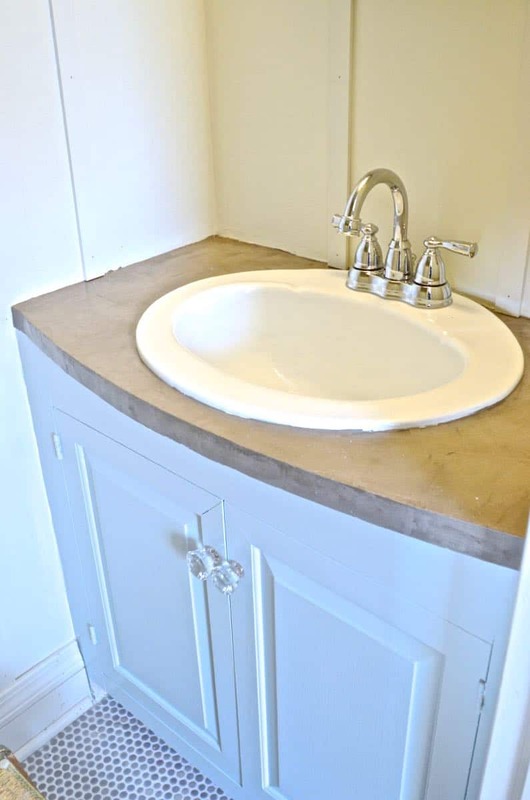 I’m hardly the only blogger to have noticed concrete countertops. I’ve always thought I’d put them in our kitchen when we ever save up enough money to gut it. Which will be in 25 years. Until then… I used it in our powder room! I can’t even remember how I stumbled across this post, but I followed it to the letter for these. So go and give Tasha a shout out from me since she gets FULL credit for this countertop makeover. I used Henry’s Feather Finish (affiliate) per Tasha’s recommendation. (Full materials list at the end of this post!) The first thing I did was sanded the countertop. I also taped below the overhang…It’s easy to clean so you can skip this step, but I was hoping to get a moderately straight edge. 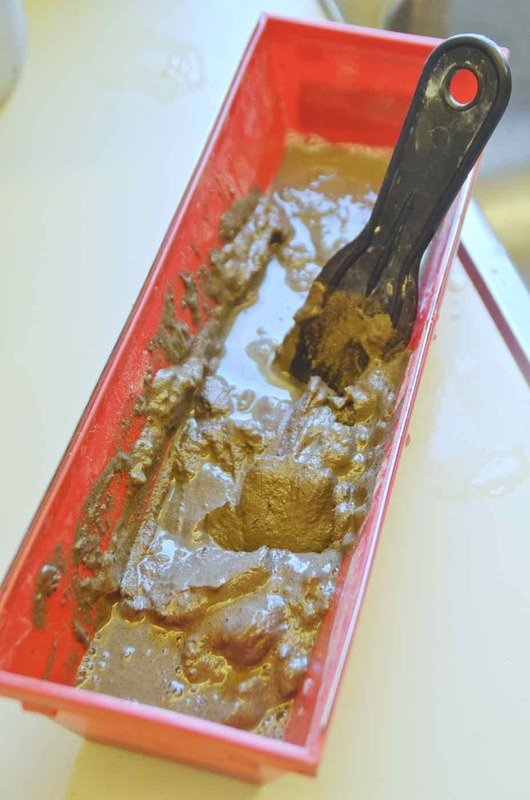 Mix up a small batch (of course I mixed WAY too much the first coat… I’d say 1-2 cups of the concrete is plenty. Mix with water until the consistency is like pudding. 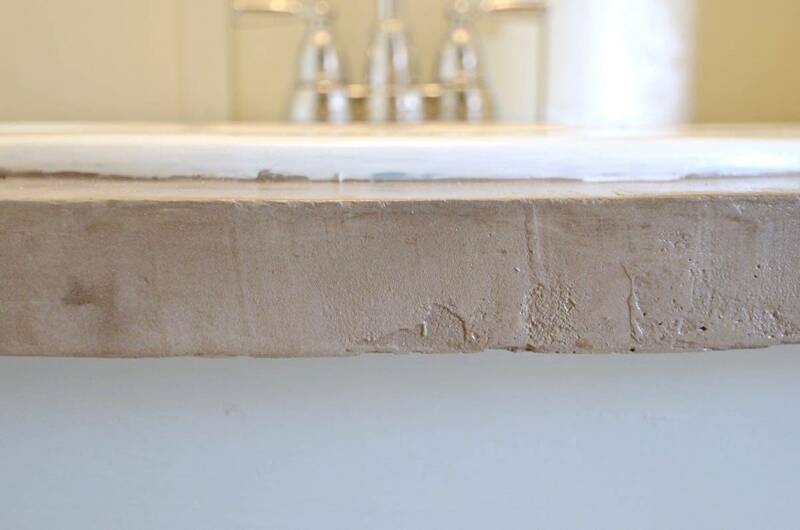 With a fine grit sand paper, sand down any rough edges or grooves. Repeat with a second or third coat of feather finish until you have the surface you like. I’ve already forgotten, but I think I took three coats, but I was ok with a few imperfections. To seal the concrete, give it a couple of light coats of this acrylic sealer (don’t leave any puddles). It will go on cloudy… don’t worry. There you have it! Just like the sink, this is a pretty big turn around for $36! Sure, it’s a small vanity so I could have sprung for a nice slab of marble or something… but, this cost THIRTY-SIX DOLLARS! 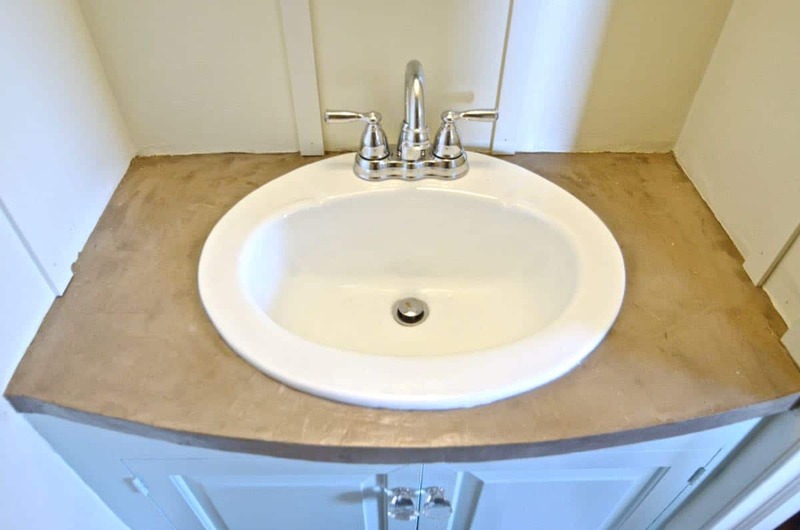 Now… $35 for sink paint, $16 for concrete vanity, $20 for sealer and $14 for paint and things are looking up in the powder room world! 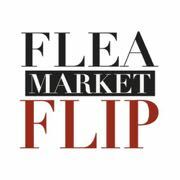 Throw in a fancy new faucet and that’s a WHOLE NEW vanity for $145. See the finished powder room here. 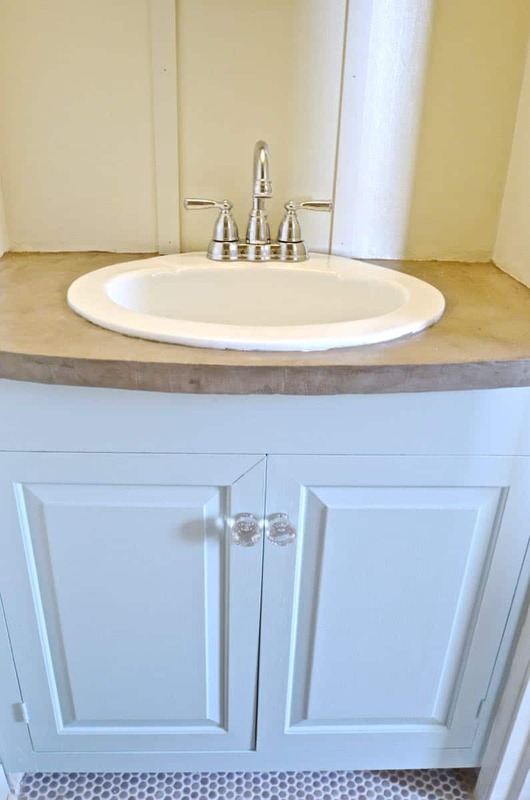 I also painted the sink… see how that went down here! Amazing!! And I feel like this all happened so quickly!! Can’t wait for the big reveal! I’m thinking of doing this and came across your post. 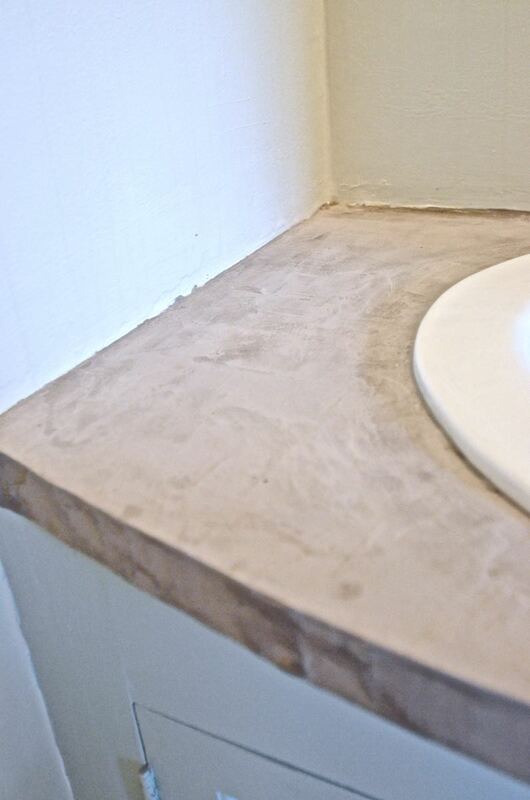 Did you tape off the edge of the sink when you were putting the concrete on or just work neatly around it? I have the same style sink and don’t want to take the finish off the sink with tape but I’m also not the neatest DIYer either… 😉 Thanks!